Welcome to Day #7 of Chocolate and Thankful Theme Week, and Day #2 of Holiday Spirits Theme Week. Today I enjoyed "the few"— another piece in the flying noir (Oakland, CA) 6-piece "spirited" collection assortment box. 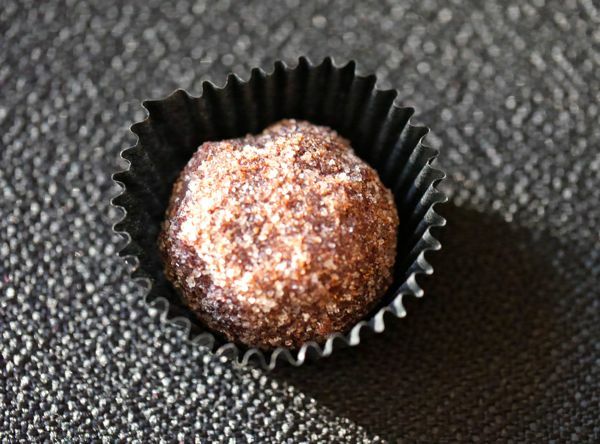 This round truffle was flavored with Few bourbon—"a three grain recipe from a small batch distillery in Illinois." A roll in sugar gave the truffle a holiday sparkle. 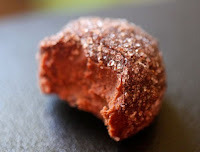 Feeling thankful about life, and that there are so many interesting chocolates and creative chocolatiers and chocolatemakers in the world. Happy Thanksgiving Eve to all.